Blackmagic today introduced a new model of its external Thunderbolt 3 graphics card eGPU. Blackmagic reacts with the new eGPU Pro to the criticism of the performance of the old Blackmagic eGPU (with AMD Radeon Pro 580) and now uses with the AMD Radeon RX Vega 56 a GPU which brings the double performance in some eGPU applications. So the Spatial Noise Reduction of DaVinci Resolve 15 runs 1.95x faster with a MacBook Pro and the eGPU, 3.13x faster with the eGPU Pro. With the GPU-lower-performance MacBook Pro 13, the acceleration is much stronger overall: it accelerates 13.3x and 21.36x respectively. The Film Grain function works 4.2x and 8.17x faster on MacBook Pro 15. The interfaces of the eGPU Pro are similar to those of the eGPU - but they are extended by a DisplayPort. Both devices combine an external GPU with a docking station. 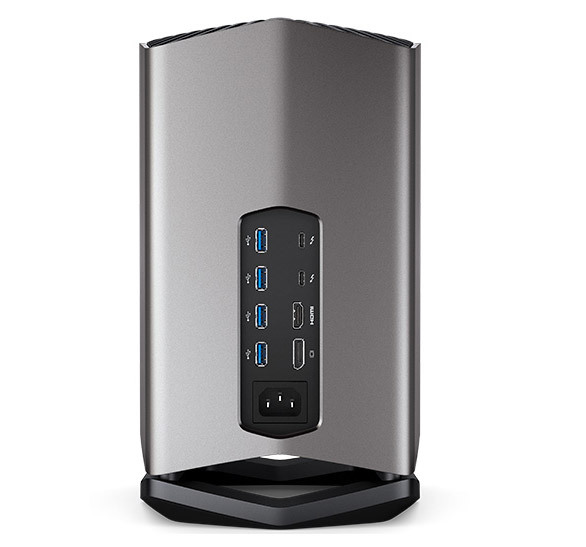 Like the eGPU, it offers an HDMI 2.0 output, another Thunderbolt 3 port with 85W power supply, which can be used to power a notebook like the MacBook Pro, and four USB 3.1 (Gen1) interfaces - but also has a DisplayPort 1.4 output, which supports 5K monitors. So a notebook is connected to the eGPU (Pro) only via a Thunderbolt 3 cable to the eGPU, which transfers power as well as image and other data - so the eGPU (Pro) can also be connected to a keyboard, mouse and an external hard drive and a monitor. The integrated Radeon RX Vega 56 has 8 GB HBM2 VRAM, 3584 stream processors and a memory bandwidth of 410 GB/s. The eGPU (Pro) also features a keyboard, mouse and an external hard disk and a monitor. The eGPU Pro supports Apple&s Metal programming interface for 3D graphics, which allows programs such as DaVinci Resolve 15 almost direct access to the functions of the graphics card. 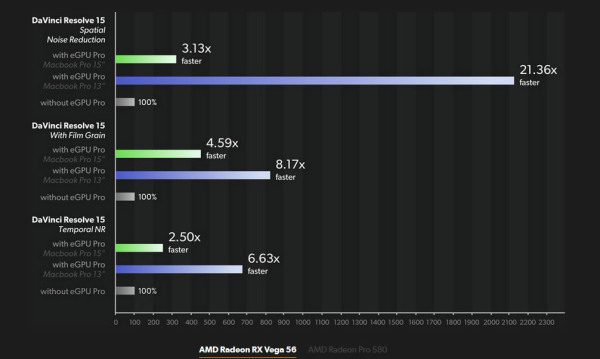 In our DaVinci Resole 14 performance test, the AMD Radeon RX Vega 56 scored very well - also in comparison with a Nvidia 1080Ti - it was at least on a par, or could even slightly exceed it. A disadvantage of Blackmagic&s ready-integrated solution in an elegant aluminum case is the built-in graphics card, which, unlike other solutions - pure eGPU cases that first have to be equipped with a graphics card - cannot be upgraded later. However, the case including its own power supply and cooling is now optimally adapted to the GPU used, which is reflected in a very quiet operating noise of only 18 dB. 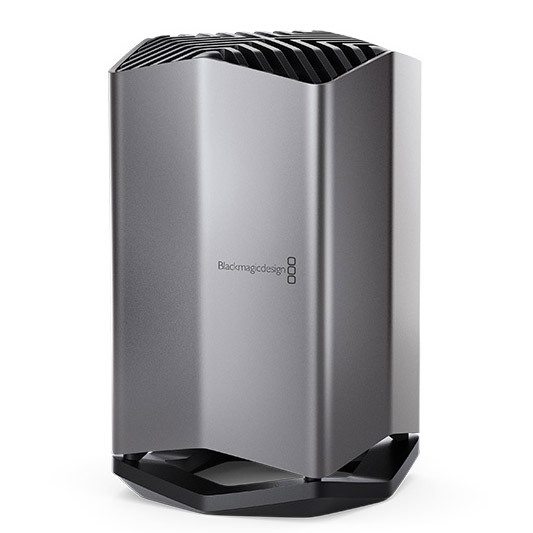 The Blackmagic eGPU will be available from November at the price of 1.359 Euro will be available exclusively at the Apple Store, the eGPU will continue to be available for 695 Euro. PS: the MacBook Air introduced yesterday now also supports eGPUs for the first time.